Flooring installers can organize financial plans and predict profit and loss for their auto sales in the public and private sector with this free, printable business plan. [COMPANY NAME] is a Start-Up Limited Liability Corporation owned 50% by [NAME] and 50% by [NAME]. It is a Company that is about to offer the client and community a new type of countertop and alternative flooring opportunity that has not been seen before. It will resurface existing tops and floors with a "Green" (recycled polymer) concrete surface that looks like granite, stone or marble, but it will not crack or break and it is guaranteed for two years against scratches and marks. The Company can reproduce any color that the client has in mind and has many colors to chose from, which can all be blended together to create any color(s) necessary. [COMPANY NAME] will be opening up a store/warehouse location in [STATE] but will be serving seven Counties within the states of [STATE], [STATE] and [STATE]. [COMPANY NAME] intends to provide a quality product at a very reasonable and competitive price to clients and the community. It feels that having the opportunity to be the only distributor for this area and a trained and certified installer, the Company will be able to train others to perform these tasks and provide a network of qualified installers who are very knowledgeable in the products and the many aspects of providing less expensive, guaranteed products to the client base. It is the Company's goal to establish a showroom, warehouse and training center within the [CITY], [CITY] or [CITY] area that will serve the entire community, by providing a means of showing clients what can be done with their existing tops and give them ideas about what they might change to get a totally new look for their home or office. These products being "green" will give the Business the opportunity to enhance the environment that they live in as well as their community and it will be working with various organizations to help them understand the concepts of "going green". 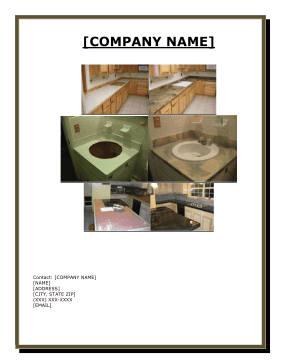 [COMPANY NAME] provide the client with [COMPANY NAME] Countertop products. These are used to resurface existing countertops, such as Formica, granite, marble and other solid surfaces to replicate granite, marble, natural stone or completely customized tops. [COMPANY NAME] Flooring Overlay can be installed over existing flooring, such as concrete, wood, and linoleum. [COMPANY NAME] products are designed to compliment your current style and color specifications. Once installed, [COMPANY NAME] products are easy to clean and maintain. [COMPANY NAME] Flooring products give you the look of Flagstone, Slate, and many more natural stone flooring products right over your existing concrete. If your concrete is ugly, discolored, or even cracked, our Concrete Overlay system is the perfect choice for enhancing your indoor or outdoor surfaces. This newly developed "green" product is designed to meet the most demanding residential and commercial decorative specifications for either interior or exterior locations. Any imaginable patterns including, but not limited to, slate, tile, flagstone, travertine or Saltillo can be replicated by [COMPANY NAME] certified installers in a nearly unlimited color selection. The finished product withstands the rigors of residential and commercial pedestrian or wheeled equipment traffic retaining its beauty throughout a long serviceable lifetime. Experienced decorative concrete contractors conducting beta-site testing unanimously agree that the [COMPANY NAME] Overlay System is more economical and is easier to use than similar product formerly available. This is a testimony that [COMPANY NAME]'s efforts to manufacture and market a product that takes into consideration reduced material costs and decreased installation labor expense have been successful. The proposed start-up business will market to the general public within seven main counties of [STATE], [STATE] and [STATE]. The customer base is any person that has a counter top or floor area they would like to replace or make different. The Company can partner with contractors, home improvement companies, cabinetmakers or concrete finishing companies. By resurfacing and not removing, rebuilding and replacing, [COMPANY NAME] not only saves the client money but it also saves room in our landfills as well. The Company looks forward to becoming an East Coast Distribution Center for [COMPANY NAME] Products and to expand the warehouse, packaging and shipping for shipping to the majority of the East Coast, creating employment opportunities. The current financial plan is for [COMPANY NAME] to obtain grant funding though one or many government and/or private grants in the sum of $329,000 in the first or second quarter of 2011. This funding will be utilized to purchase equipment and a vehicle, construct leasehold improvements, and launch an aggressive marketing campaign.